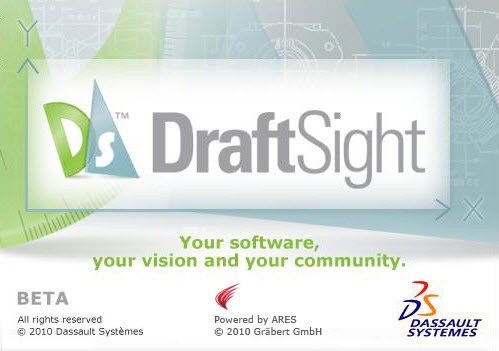 Dassault Systemes today announced the introduction of DraftSight, a 2D CAD tool that is available for download for FREE at DraftSight.com. Last week I was contacted by a PR agency and was asked if I would like to see the product first hand and review some of the details of the program. I jumped at the chance and even got to test drive a pre-beta version of the software to see for myself what it was all about. Below are the highlights of what is being offered. If you print or save, a one-time e-mail submission is required for the Free version. The product is little over 40 megabytes when downloaded. Installation literally takes less than a minute. The interface is VERY Clean. The look and feel is very “modern” which is refreshing when compared to the IntelliCAD based SolidWorks 2DEditor (DWGeditor). It also contains some enhancements which do make this product unique. 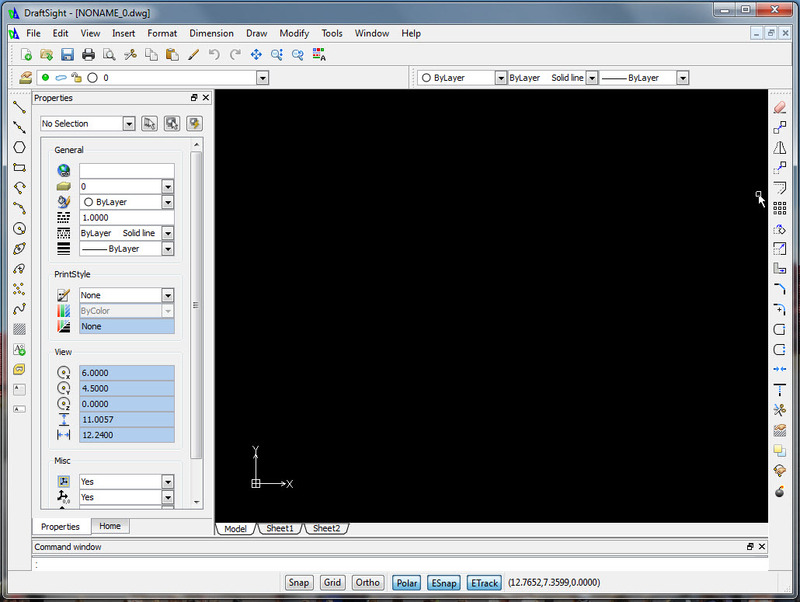 Below is a screenshot of the default screen you see when you start the program. Although I don’t use 2D tools very much at all any more, I was still able to find my way around the product since it is VERY much like AutoCAD. One of the features I immediately noticed is that DraftSight contains a Polar snap setting, which was always missing in DWGeditor. 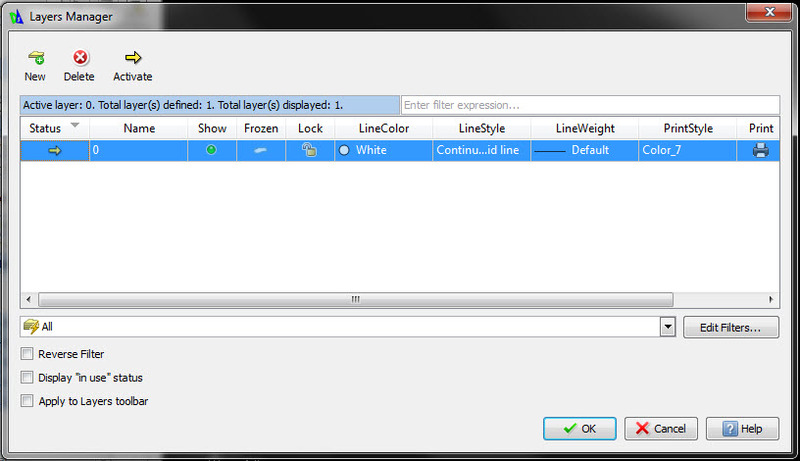 The layers interface is very clean and appears to have all the major tools and features necessary. Below is a screenshot that shows all the details. 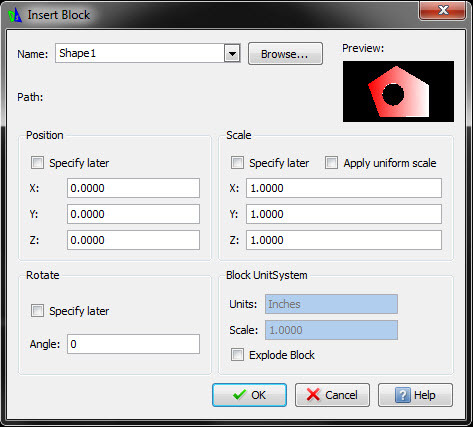 One of the unique features of this tool is the Enhanced Command Window which features colors for options as you enter geometry creation commands. This makes the options standout and will allow the user to identify the options available much faster. Basic Block Commands are also available. The example I created included a gradient shaded hatch. All of the placement options will look very familiar to most 2D users. If you Save or Print a file in DraftSight, you’ll be prompted to Activate the software. All you have to provide is an e-mail address. (THAT’S IT!) You have 30 days to provide this e-mail address. After that you will have to provide it in order to continue using the product. 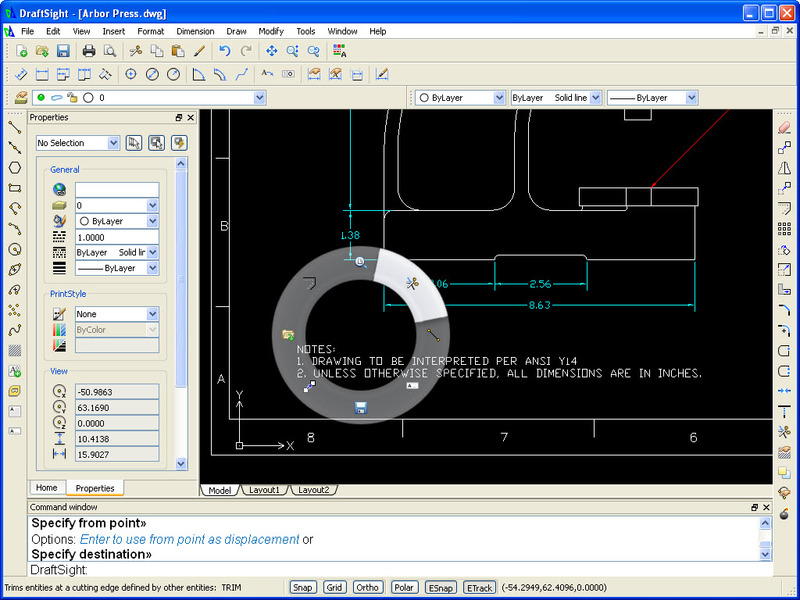 DraftSight also has a mouse gesture wheel feature that functions very much like its counterpart in SolidWorks 2010. Performance is key and according to Aaron Kelley, Senior Director of DraftSight, users should see a significant performance increase when compared to SolidWorks 2DEditor. Of course I had to test this for myself and I must say the results were very positive. A 19 megabyte test file (cannot show the content on the screen…sorry!) 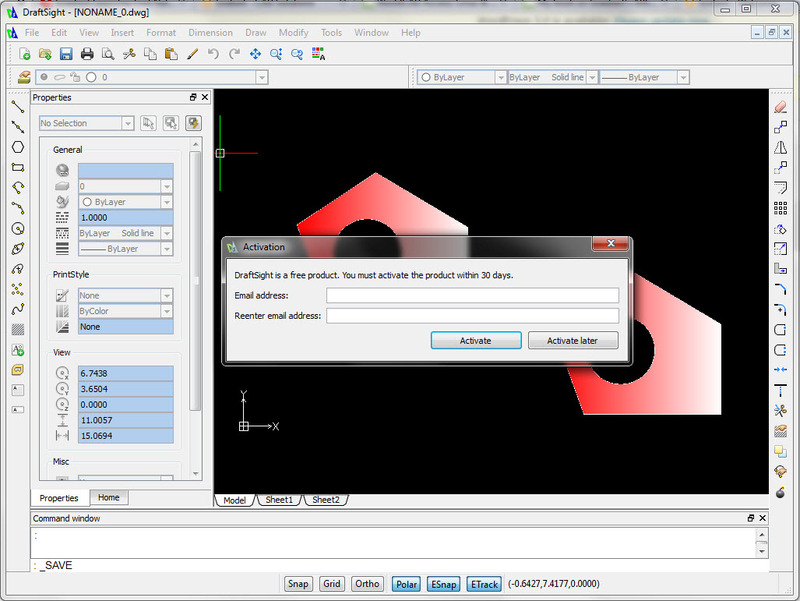 loaded in about half the time it took to open the file in SolidWorks 2DEditor. This product is being lauched as a Beta. This is pretty common these days with many software companies…after all…Gmail was labeled “Beta” for quite some time. All Dassault Systemes reseller channels will be selling a Commercial version that includes the API access and Technical Support for $250 per year per license. It is a standard FlexLM setup that will allow multiple users to access the available licenses on the server. One of the interesting aspects of this product is the Community approach. The DraftSight Community is an area setup within the new Dassault Systemes SWYM online Community. (SWYM stands for See What You Mean) The hope is that the user Community will provide lots of feedback on the product which will drive future enhancements. It was stressed that this product WILL be enhanced and will always offer a FREE version. I’ll cover more about SWYM in a future post as it is just now being launched along with this product. The technology behind this product is NOT IntelliCAD. It is based on ARES which is a newly launched platform from German based Grabert CAD solutions. Later this year a MAC & LINUX versions of this product will be available which follows in line with product announcements already made by Grabert. I did ask about the future of SolidWorks 2DEditor and was told that announcements regarding that product will be made later down the road. The fact that such a comprehensive 2D tool is now being offered for FREE is without a doubt a groundbreaking action within the CAD Industry. Although it may not have the Bells and Whistles of some of the other 2D CAD packages, it offers an amazing amount of functionality for virtually no cost to the user. So perhaps Dassault will need to add “2D for Everyone” as a slogan to go along with their “3D for Everyone” mission statement. What will the other CAD vendors say? Well, I’m sure we’ll hear all about how DraftSight lacks this feature and that feature, but the bottom line is this package is not trying to be the ultimate 2D package. 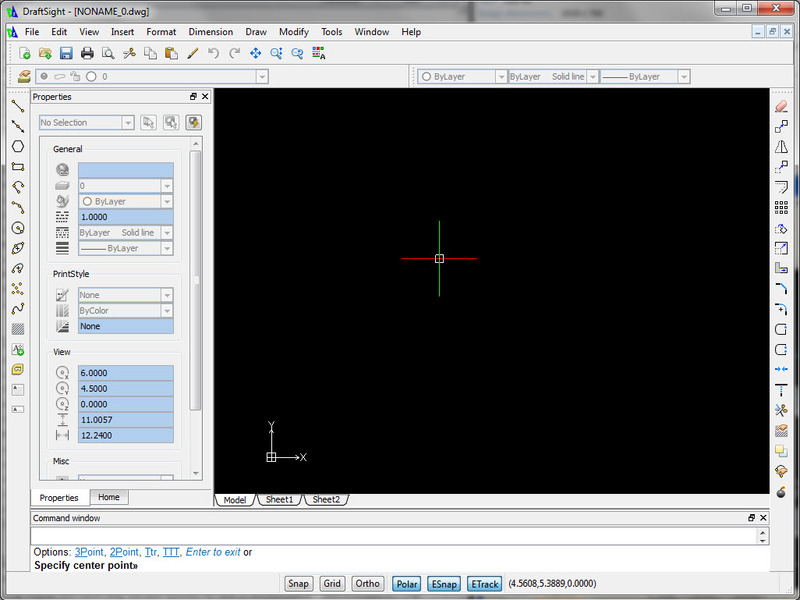 It offers basic 2D functionality at no cost to the user. Pretty impressive. So far, I am really impressed with this product. The interesting test will be putting it through its paces in the hands of the user. After more folks (along with myself) have kicked the tires of the Beta version of the product, I’ll post the results here on the site. Stay tuned….much more to come!